From Silverthorne or Dillon, follow east on Hwy 6 and drive about 8 miles, passing the Keystone Lodge, to East Keystone Road. There turn right into River Run Village and go around a curve on East Keystone Road to River Run Road where you will turn left. 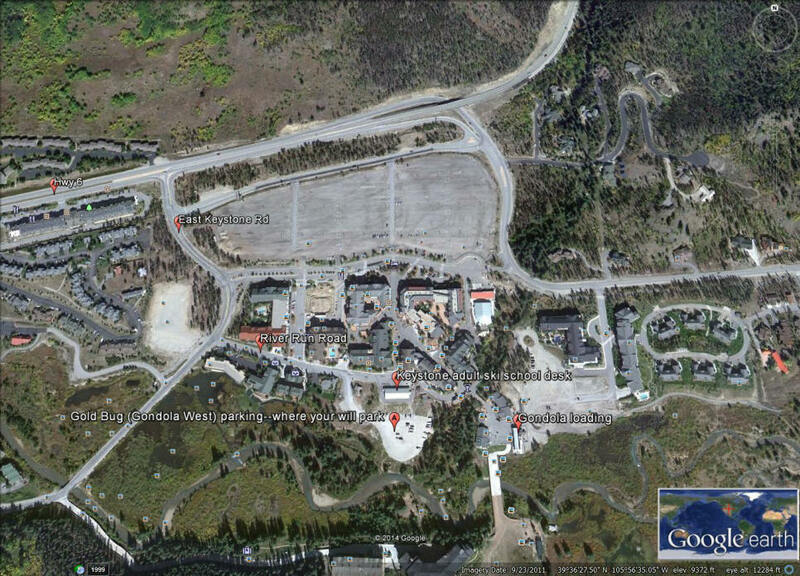 On River Run Road turn right into the Gold Bug (also called Gondola West) Parking Lot. At the entrance gate, give your name and if you have reserved in advance you should be passed in free (just in case have a reservation confirmation handy). From the parking lot, walk north up stairs toward the east (right) end of the long rectangular structure that is a sort of yurt tent building. Inside find the Keystone adult ski school desk to do your paperwork. There is a place to put on ski boots and lockers to leave shoes, etc. if you wish. There is also a rental shop in this building. When done walk back outside to the east. 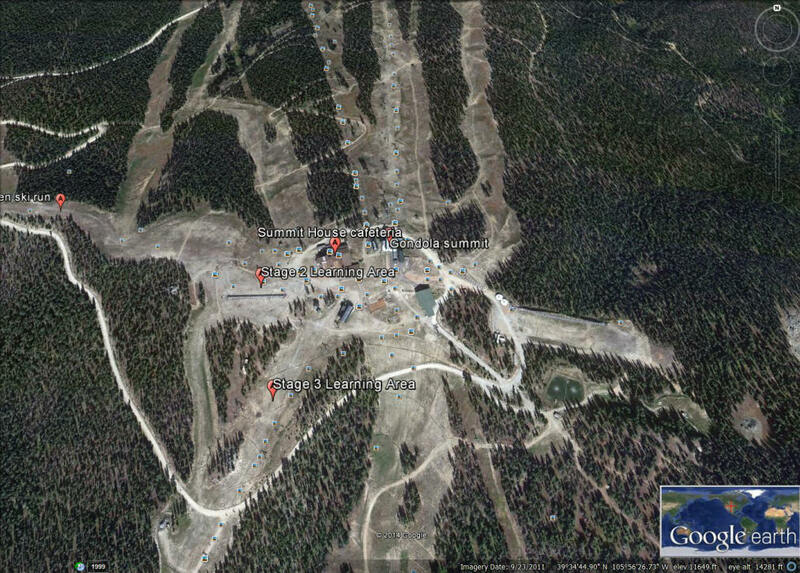 The private lesson ski school meeting place is about 50 feet from the northeast corner of the building. I will be there (in a blue uniform) to meet you unless I find you sooner in the building. 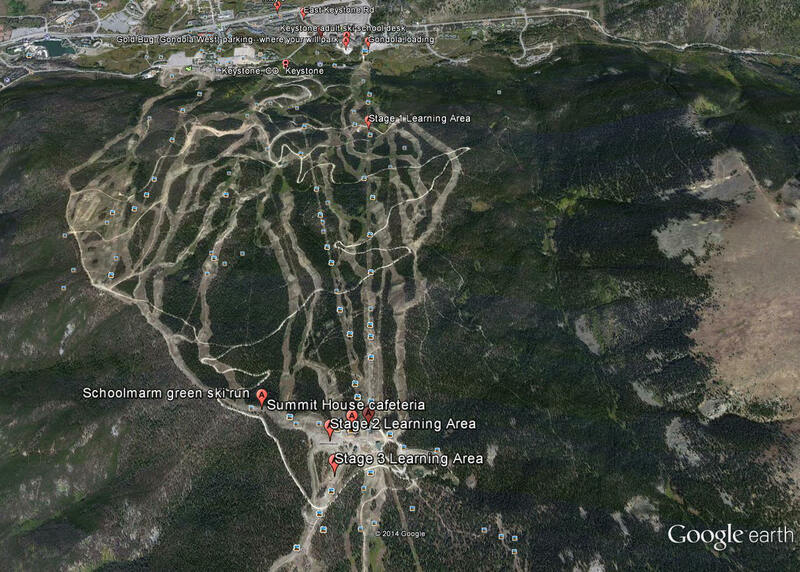 Once together, we will walk to the Gondola loading (there are rest rooms and drinking fountains on the way). We will board that (cabins take up to 6 or so) with our gear. Assuming we need to start at the very beginning of learning to ski, we will go up the gondola to a point about 1/3 from the bottom where there is a mainly level place to begin getting used to equipment, sliding, walking, stopping, initial turning, etc. If we master Stage 2 of learning, there is another Stage 3 slope that is again a bit steeper and is served by a chairlift. Most folks on the first day do not get beyond Stage 3 (if they get to it), for the next stage is to descend the Schoolmarm ski run back to where we started the day. Because Schoolmarm is a 3.5 mile run, it is unwise to start down it without efficient technique and especially at the latter part of the day when folks can be tired and skier traffic heavy. It is usually more productive to continue practicing on the Stage 3 terrain and then ride the gondola back to our start. There are some environmental factors to consider. The weather could range from too hot to too cold, so dressing in layers with clothing that has zippers and vents helps. Sunglasses are needed if a bright day, goggles otherwise. A gaiter for the neck is useful when cold. Gloves or mittens are necessary even if warm (to reduce injury chance if a fall). It is difficult to predict weather at the top of the mountain when at the bottom, and the weather can change anyway, so it is best to have options with you. Hats with ear coverings are wise. Children 14 and under are required to wear helmets when in lessons (these are available at Keystone rental shops). 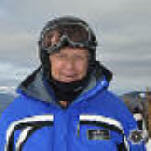 Finally, altitude effects can occur in people, for the lift base is at 9,000 feet whereas the mountain top is at 11,640 feet; getting adequate rest before a ski day and staying hydrated and nourished are said to help reduce altitude effects and sunscreen is always needed on exposed areas of skin. Maps of River Run Learning Areas fun. This "What You May Expect in a Level 1 Private Ski Lesson at River Run, Keystone" page last modified 11/03/2017 07:21:36 AM. Did you come here from a link on another website? For latest version of this page, copy to your browser: http://www.SkiMyBest.com/skibegrr.htm. Copyright © 2013, 2014, 2015, 2016, 2017, 2018, 2019. William R Jones.